The suggested retail prices range from £70 to £200. Something for everyone's budget. 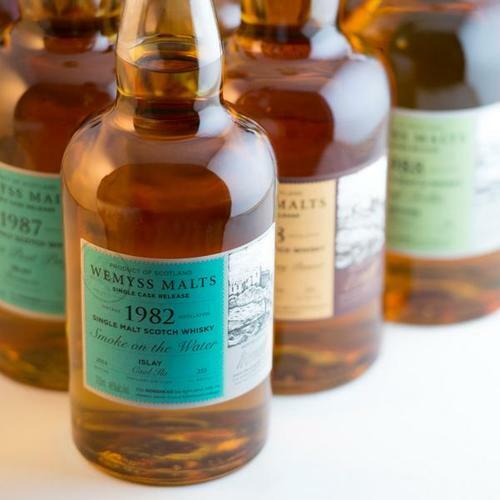 My personal eye candy are a 1987 Bowmore (“Sweet Peat Posy”), a 1983 Caol Ila (“Smoke on the water”), two 1997 Clynelish expressions (“Cayenne Cocoa Bean” and “Bench with a Sea View”) and their second single grain from Invergordon (“Vintage Strawberry Punnet”) 1988. 261 years of flavours and history in one release ! Wemyss is a relatively young company when it comes to whisky. Established in 2005, they managed to build an extended range of blends, blended malts and single casks. In the autumn of 2014 they will start producing in their own distillery Kingsbarns. One mash tun, 4 washbacks, one wash still and one spirit still should allow them to distill 500.00 liters of new make spirit. Using local barley they wish to deliver a fruity Lowland-style whisky.